One of the most striking differences between the iOS and Mac OS platforms is that the former lacks the primary organizing metaphor of the “virtual desktop” that has been crucial to the Mac since its introduction in 1984. It’s remarkable how unremarked this difference has gone—apparently the app-centric environment, sans Trash Can and folders and drop-down menus, is just fine for most users. The only reason it’s being remarked upon here is because iWill HD—a personal productivity app for the iPad, which features a Getting Things Done work-system at its core—does attempt to provide an old-fashioned pseudo-desktop. 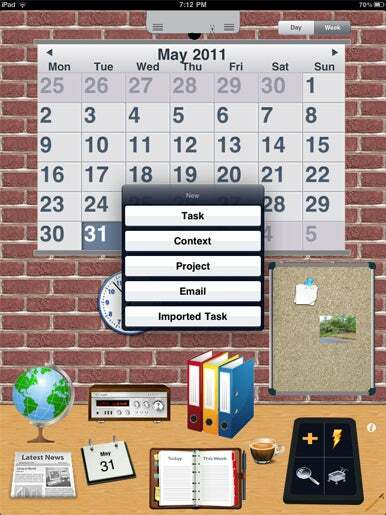 When you launch the app from Sud Soft Systems, it’s all there—a large wall calendar (on a brick wall background), an analog clock, a “cork” board, three-ring binders, a tuner, newspaper, globe, dayplanner, even a cup of coffee. Desk Job: iWill’s provides access front-and-center to Getting Things Done tasks, contexts, and projects; peripherally, you also have access to your iPad’s music library, a mapping system, a basic Web browser, and a bulletin board where you can store notes and images. Tap on the tuner, and you get access, from within the app, to your music library (but not, alas, Pandora, WunderRadio, or other such services). Pick some tunes, then tap on the newspaper and … a basic Web browser opens, providing access to any site (no default news site is chosen). The browser is very limited—there’s no obvious, simple way to import bookmarks, and no way to print pages, but it does reside entirely within the app. A nice “GPS” feature, which works even on iPads without 3G, enables you to add locations to tasks, and then see “nearby tasks” on a map. 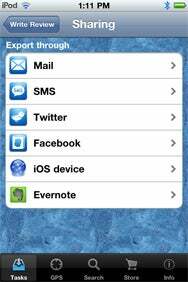 You can send e-mail from within the app and share tasks via mail, Twitter, Facebook, Evernote, and—if Bluetooth is enabled) with other iOS devices running iWill HD or the iPhone version of iWill. The latter feature require “remote reminders,” a concept that is somewhat confusing, as the in-app help says that you can use up to “63 local reminders (for free),” but that to use more than 63 reminders goes beyond a limitation intrinsic to iOS. The solution: you can purchase, from within the app, reminders in packs of 500 (for $1) or 1,500 ($3). Remind Me: This view of iWill on the iPhone displays one of app’s strengths—the many different ways it enables users to share task reminders—and also hints at a weakness, the requirement that heavy users purchase ‘reminder packs’ in blocks of 500 or 1,500 if they want to use more than the 63 that fall within iOS 4.0’s limitations. The iPhone version of iWill lacks the desktop metaphor—no music player, Web browser, bulletin board, or even cup of coffee adorns the pocket-size version (though it does have the map/GPS locator). But like the iPad version, it is a solid, if unremarkable, GTD app. If you switch frequently between an iPad and iPhone or iPod touch, it might be worthwhile to have both versions, especially with the reminder-sharing capabilities. iWill HD and iWill may be best suited to Getting Things Done beginners. The task-management method can be complex and require a steep learning curve, especially compared to the good old to-do list. In addition, it’s not a method that works for everyone. Some other apps that accommodate GTD, such as Things, are more elegant and—at least in the case of Things—support free syncing between the iPhone, iPad, and Mac versions of the program. There’s no need to purchase packs of reminders. The reminder purchase requirement could be considered a serious limitation for an app that features reminders as a core capability. Reminders are a key element of Getting Things Done, and while personal use of reminders will vary, having to make in-app purchases of reminders could turn into a slow bleed of funds for some users who make iWill and/or iWill HD their primary task manager. On the other hand, if you’re a beginner or not a “power” Getting Things Done practitioner, you may find iWill and iWill HD’s core capabilities sufficient and the interface attractive.